In NobelBiz v. Global Connect, a jury sided with the patentee-finding that global connect infringed the caller ID modifying patents. On appeal however the Federal Circuit has reversed on claim construction – in a non-precedential opinion. The claimed invention is associated with telemarketing, and the idea is to “provide a callback number … that may be closer to or local to the target.” (Quoting patent specification). The claims themselves require an “outbound call,” “replacement telephone number,” and “modif[ing] caller identification data.” Pretrial, the District Court determined that these terms needed no further claim construction but instead should be given their “plain and ordinary meaning.” However, during the jury trial technical experts from each side provided testimony as to the meaning of these claim terms. On appeal Federal Circuit’s first holding is that “allowing the experts to make arguments to the jury about claim scope was erroneous.” Rather, claim construction is the responsibility and duty of the judge rather than the jury. The judge must inform the jury of the scope of the claims, enabling the jury to then determine whether those claims are infringed. Further, the Federal Circuit found that the lower court also erred by failing to construe terms whose scope was disputed. Following its precedent of O2 Micro, it is not enough for the court to simply state that the definition use “well understood” when the parties dispute the scope covered by the claims because that would leave the jury with the responsibility of determining the claim scope. An oddity of the majority opinion is its sole focus on claim construction without considering the impact. Majority opinion has no discussion as to whether the minor tweaks that it provides for the meaning of a replacement telephone number would have any impact on the jury’s opinion, or if the jury could have reached the same conclusion of infringement under the modified claim construction. In her dissent judge Newman provides a reason for the majority’s lack of explanation: “We are not told how these corrected definitions could have changed the result at trial.” Note here – for instance – the majority found that the claim construction should have specified that the claimed “replacement telephone number” must “replace something . . . [such as] an original phone number.” Ordinarily, a minor tweak would not require vacatur of a jury verdict without first considering whether the change might have some impact on the outcome. I would also add some comment here that relates to the majority’s first holding: “Allowing the experts to make arguments to the jury about claim scope was erroneous.” Of course, whether certain testimony is permitted or not is ordinarily well within the discretion of the district court judge. Here, the court found it reversible error without (1) providing deference to the lower court or (2) considering whether the testimony somehow threw the jury off track in an impermissible way. U.S. Patent Nos. 8,135,122 and 8,565,399. Patents claim an invention for modifying the caller ID seen by a call target. O2 Micro Int’l Ltd. v. Beyond Innovation Tech. Co., 521 F.3d 1351, 1361 (Fed. Cir. 2008). Summit 6, LLC v. Samsung Elecs. Co., 802 F.3d 1283, 1291 (Fed. Cir. 2015). Patent tanked due to inequitable conduct arising from failure to submit references, where the references and relevance were known to the applicant but didn’t show up until anonymously submitted to the PTO by a third party days before the grant (after which the delayed references were cited in all of the patentees related cases). Did they not get considered before the patent was issued? MM, you fail to method the litigation misconduct that amount to a cover-up of the intention to mislead the PTO. The case is going to get discussed eventually. IN AMERICA WE DON’T WORSHIP GOVERNMENT – WE WORSHIP GOD! Someone please, please, please put this toxic vile ign 0ramus out of his misery. What has this to do with patent law? PLEASE try to keep your rants at least remotely on topic. Remember, folks: “anon” is all about the Constitution. He’s very very serious about it! Because it’s such a serious thing. Very very serious! He never stops talking about it and how oh-so-important it is to pay attention to it at all times. Separation of Powders! It’s pretty much an all-consuming subject for him when his precious patent rights are threatened in the least possible most oblique ways (“THEY’RE GOING TO MAKE YOU DOCUMENT ALL YOUR PERSONAL PROPERTY NEXT!” “STAR CHAMBERS!” etc etc we’ve heard it all). But beyond that: meh. We should all just sit quiet so the snow falls quietly in “anon’s” little bubble world. He’s important and special! Without him looking out for this magical “little guys”, we’d all be like the Amish. That’s how much he matters, in his own mind. Check yourself dude – this is a patent law blog. Try to pretend you know what that means and take your pure political rants to an appropriate forum. And you’re totally not a defender of Mango Hairball. Nope. Not you. Keep the laughs coming, Billy. Start paying attention to what I actually state. Try – try – try to stay on topic (that topic being patent law). Your noise to signal ratio for anything even remotely concerning patent law is high enough as it is. So, another weakening of the patent system from a Google judge, Hughes. We have to dissolve the CAFC to get rid of these Google appointments. Wow, that’s really impressive stuff. The results oriented nature of CAFC must be maddening to the D.Courts. As we all know, even after the purported ‘claim construction’ – definition phase – the parties often go on to fight over what the purported clarifying definition covers. It’s no wonder why many D.Courts are fed up with patents, if even after all the time and energy is put into a case and all the procedural steps of going through a jury trial, you get this monday morning quarterbacking by CAFC. The CAFC is merely applying its own “lessons learned” from the exact same type of Monday Morning Quarterback, desired Ends based controls as applied by the Supreme Court. I guess this is what qualifies as humor among the glibertarians. Very clever people! I like how the majority criticizes the district court for not resolving the claim construction dispute raised by the parties, but then it comes up with its own claim constructions, different from those proposed by the defendant. Yet again with the dissembling of “logic patents”…. How is that copyright project coming along? “Catch and release” or “originate” — the infringer used the latter. The specification showed both. The point of their claim construction argument was to limit the claims to the former that they not infringe. Where the specification shows two (or more) embodiments, isn’t the goal to see whether the claim was intended to read on only one if the claim can be construed to read on all? I can see how the system could work with an originator that selects a target, but before the call is actually sent, the system of the invention replaces the caller ID of the originator with one of closer caller IDs in the DB. It would be interesting to know why the examiner required the term “replacement” to be used. The last sentence of the majority opinion pointing the lower court to consider summary judgment is telling. Another results oriented opinion. The decision is a travesty, a miscarriage of justice. How on earth did this junk get to trial in the first place? 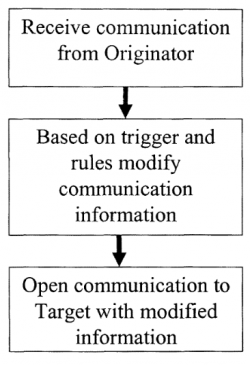 “Use rules” to decide what information gets sent over an existing communication line? Seriously? Nobody could have predicted any of this! All we need to is expunge logic patents from the system with extreme prejudice and the farce will end itself in short order. Logic? Logic? We don’ t need no stinking logic! Copyright will protect that, eh? Percent chance that Silicone Valley Girl is actually a girl? Percent chance that MM melts in your mouth, not in your hand. 2) why do you care? 3) with the record of fake names chosen in the last five years undoubtedly belonging to you, and many, many, many of those far worse than “Silicone Valley Girl,” don’t you think your post questioning a moniker to be more than a bit ostentatious? Maybe you should focus on content and responding with content and without ad hominem (or at the very least, without ad hominem being the primary constituent of your posts). Maybe something different than what we have seen for the past 11 years…. Computer logic being worthless must by why no one ever pays any money to acquire companies that are developing new computer logic instructions. Why pay for something that is inherently “already in there”…? But, hey, nobody expects the patent maximalists to be able to read. Question: how much kool-aid do you have to drink before you unquestioningly assume that everything with some amount of “worth” must be eligible for patent protection? Answer: at least two olympic size swimming pools of kool aid. Question 2: are people in Sillycon Valley extra smart or just more inclined to engage in grifting con games at the expense of everyone else? Go ahead and ask me how I know this. Yet more of that Malcolm number one meme in action…. LOL Pedantry at its absolute finest. Tell it to your maximalist brot@rd who posted “Computer logic being worthless” in response to my suggestion that logic patents should be expunged from the system. Better yet, “anon”: just get a l I f e. We can all read the comments and we know that guys drink the Patent Everything Kool-Aid like there’s no tomorrow. You fail to grasp the point. Your number one mem of Accuse Others… keeps getting in your way.